Wonderful image of the Chair of St. Peter in The Catechism of the Council of Trent by the old TAN Books. You will be so grateful to read The Catechism of the Council of Trent. Oh! If only more priests and religious today would read and use this catechism in their training and instruction. Can you follow the Catechism of Trent today? Did you know that the Baltimore Catechism is based on the CCT? It's simply the Q&A version that the Bishops of Baltimore needed while the Roman Catechism was being translated into English. The History of The Catechism of the Council of Trent. Years and years ago, it seemed to me that it was a big hard book to read. Nope. You'll find that it's not any more difficult to read than any other high school catechism. Read it yourself or use it for high school. It is so very interesting that you can use it for 11th and 12th grade religion class or for high school catechism class. Historically, it was more commonly called the Roman Catholic Catechism or the Roman Catechism. Simply. Other religions have their own catechisms: Anglicans, Lutherans, etc. The introductory pages are one of the best histories of a book that you will ever read. The prefatory article really helps you understand why it took so long to publish the Roman catechism in the first place. It explains a long list of who was involved in the Council and its catechism. The effort to publish a good English translation was another super interesting story that teaches the importance of choosing the right words in a catechism. What's further is that two saints worked on it: Pope Saint Pius V and Saint Charles Borromeo. The Council met at a small town in the Austrian Tyrol, named Tridentum which translates in English as Trent. It produced a large number of canons and decrees and condemned the errors of the Protestant Reformation. "Of the twenty Ecumenical Councils of the Catholic Church, the Council of Trent is universally regarded as the greatest-in the scope of its discussion, in the number of its pronouncements, and in the extent of its influence." 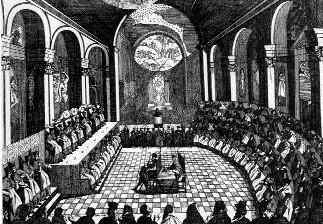 The Council made pronouncements on justification, the seven sacraments, the Catholic Eucharist, the nature of the Latin Mass (See the Incredible Catholic Mass), Transubstantiation, the sacraments of Catholic Penance, Extreme Unction, Marriage and Holy Orders, and numerous other topics of doctrine and discipline. Among these were the confirmation of the Nicene Creed, the authenticity of the Latin Vulgate Bible and the canonicity of all and only the books contained therein, definition of the doctrine of Original Sin, affirmation of the doctrine of Purgatory and the invocation of the saints and veneration of them and their relics, and the nature and application of indulgences. The Council also called for the revision of the Breviary, publishing of a formal catechism (The Catechism of the Council of Trent), and the standardization of the Roman Missal, all of which were accomplished by St. Pius V.
Pope St. Pius V reigned at the end of this Council of the Roman Catholic Church and was the one who standardized the Traditional Latin Mass which is one reason that many call it the Tridentine Mass or Mass of St. Pius V.
"General Description: In a brief pontificate of six years, Pope St. Pius V (1566-1572) vigorously promulgated the decrees of the Council (1545-1563), issued the Roman Missal, the revised Breviary, and the Catechism called by the same name (all of which has served the Church for more than 400 years), plus excommunicated Elizabeth I of England, established the Index of Forbidden Books, chose 314 bishops, wrote hundreds of bulls, and gathered an allied Christian force which destroyed the Turkish fleet at the Battle of Lepanto in 1571, bringing to an end their dominance of the Mediterranean Sea. In this brief, popular biography Professor Anderson scrutinizes the character, virtues and achievements of a saint who has to have been one of the greatest Popes of all time." It took two centuries to finalize a standard edition in a worthy English translation which was not available until the beginning of the 1900's! See TAN Books' version to see the history of the English translation of the CCT. It is an excellent example of the difficulties in publishing an excellent book! The Catechism of the Council of Trent (CCT) has been the concise standard for adult Catholic Religious Education for years. It is a consolation to see saints as the main contributors in charge of the Council of Trent and its Catechism. You will appreciate its concise presentation, easy readability, the interesting stories, and the many connections made to Bible stories and the Traditions of the Catholic Church! The CCT is the most well known fruit of the Council and is available today from many companies and is even printed online by several. Your favorite edition will be the old Tan Books version by John A. McHugh, OP and Charles J. Callan. It has the best "translation" with fewer errors than the Donovan version. The wonderful prefatory notes explain the history of publishing it well in English. 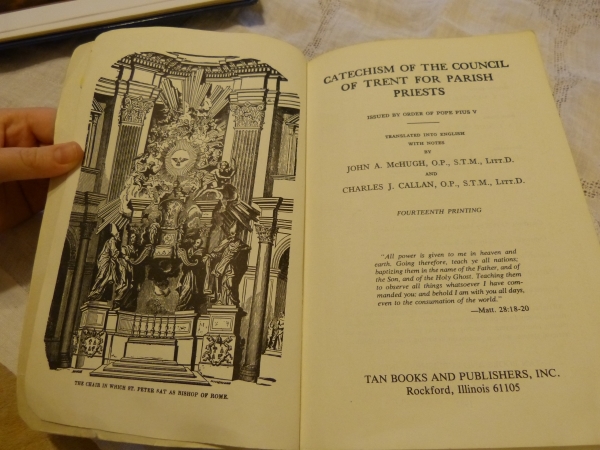 The only difference from other publications of the McHugh and Callan version that you'll find is the beautiful pictorial plate of "The Chair In Which St. Peter Sat As Bishop Of Rome" as found in the TAN Books edition. Other versions (Baronius) seem the same all the way through this edition except for this picture. If you're studying for yourself, this will be your most valuable book for adult religious education. You can also use it as a Catholic homeschool book for high school. It is plain and easy to read with some beautiful surprises! See page 81 ff. for notes on the Particular and the General judgments! It has an excellent guide for Sunday sermons (p. xxxix) that priests can use so as to cover what they should cover in their Sunday sermons each with a Dogmatic Subject and a Moral Subject. The faithful are more likely to learn what they should learn to be able to keep, practice and defend the Faith reading this book. Each year would then cover the whole course in Christian doctrine. Imagine that! The world would be a better place today if more priests would actually use this book's recommendations. You'll be edified by the explanations in the Catechism of Trent especially since the English translation has used the Douay-Rheims Bible for its quotes, gave expansions of ideas and of stories of the saints WITHOUT prevarication or dissipation of the basic Catholic beliefs. We've used it for several of our children for their high school catechism book and you can too. Seriously, it gives you and the children a great springboard for discussing topics that really matter. It will also keep you current on some saint and Bible stories. You'll marvel each time you read it with your next child at the many new things you'll realize or that will apply to some new aspect of your daily life. I sure have. Actually, the children are glad that they've "read" it. It seems like a big book, yet reading it five pages a day is very doable. Itt is a very complete book of the Roman Catholic beliefs, that keeps your attention. I had not realized that the Council documents were not the same thing as the Catechism. The Catechism itself was "ordered by the Council", so this book the go-to source for reading about the actual council, not the catechism. You can also find it available from the many Catholic companies that carry Tan Books. I am surprised at what a small book it is for as many years as it took to complete the Council. The Council had its own documents and findings, and these are found in the book called The Canons and Decrees of the Council of Trent (which you can buy at Amazon here). 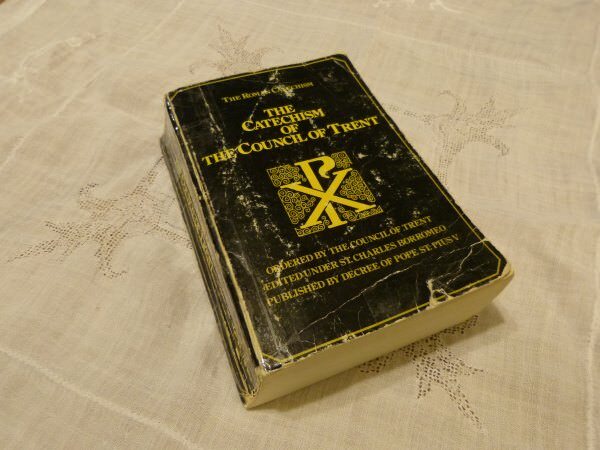 The Catechism of the Council of Trent is an excellent high school catechism.